Members in India, Express Global Logistics (EXG) are pleased to report they have been shortlisted in the Breakbulk Waterworld Photo and Video Contest. EXG would like to ask their fellow members to cast their vote for their photo! Please click here for instructions from EXG on how to vote for their photo and click here to vote. The chosen photo (right) shows a project from EXG involving the transport of 4 rubber tyre gantry cranes (RTGCs) - click here for full information. The cargo had a total weight of 535tns and each crane had dimensions of 25.27 x 11.94 x 25.10m. 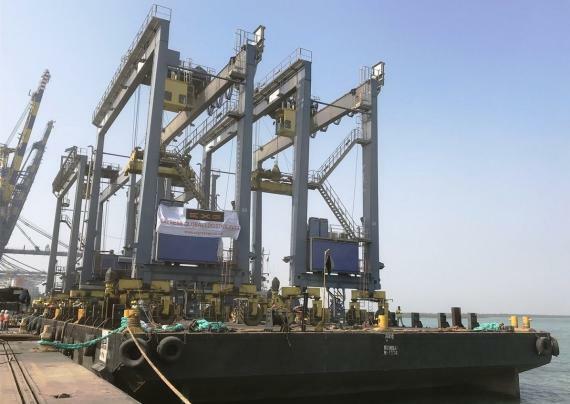 They were loaded on a barge in Nhava Sheva and discharged in Mundra with RO/RO operations and EXG overcame the challenge of a tidal range of over 4m at Nhava Sheva and over 6m at Mundra successfully.